Have a question that isn’t below? 1. What does IEP stand for? What is an IEP? IEP stands for Individualized Education Program. It is a specifically designed program to meet an individual student’s educational and functional needs so that they can access a free and appropriate education (FAPE). The LEGAL name is PROGRAM not PLAN. While this may seem like splitting hairs semantically, think of it in these terms. A plan means a general outline with activities that are sketched out in various details. It tends to answer the question, “What will we do?”. There is a certain amount of planning needed to build an IEP. In contrast, program refers to a schedule and is time-bound with specifics related to measurable outcomes. It answers the question, “What will be the results?” The results (student outcomes) are ultimately the focus of an IEP. 2. Who is responsible for my child’s IEP planning? All team members are responsible for planning as it should be a collaborative approach. Each student is assigned a case manager who will have the primary responsibilities of coordinating the meetings, contacting parents, and all documentation. 3. What Information is in Your Child’s IEP? Present levels of academic achievement and functional performance (PLAFP).This statement describes how your child is currently achieving in school. This includes how your child’s disability affects his or her participation and progress in the general education curriculum, student strengths, parental concerns, transition needs (for age 14+), changes from last IEP cycle (progress) and most recent evaluation results. Annual goals.The IEP must state annual goals for your child, what you and the school team think he or she can reasonably accomplish in a year. The goals must relate to meeting the needs stated in the PLAFP that result from your child’s disability. They must also help your son or daughter participate in and progress in the general education curriculum. Special education and related services to be provided. The IEP must list the special education and related services to be provided to your child. This includes services (specialized instruction, Speech or Language services, OT, etc.) and supplementary aids (assistive technology, one to one aides, accommodations & modifications such as preferential seating, extended time on homework, etc) that can increase your child’s access to learning and his or her participation in school activities. Participation with children without disabilities.The IEP must include an explanation that answers this question: How much of the school day will your child be educated separately from children without disabilities or not participate in extracurricular or other nonacademic activities such as lunch or clubs? There should also be statements explaining why they will not receive 100% regular education. Dates and location.The IEP must state (a) when special education and related and supplementary aids and services will begin; (b) how often they will be provided; (c) where they will be provided; and (d) how long they will last. Participation in state and district-wide assessments.Your state and district probably give tests of student achievement to children in certain grades or age groups. In order to participate in these tests, your child may need individual accommodations or changes in how the tests are administered. The IEP team must decide what accommodations your child needs and list them in the IEP. If your child will not be taking these tests, the IEP must include a statement as to why the tests are not appropriate for your child, how your child will be tested instead, and why the alternate assessment selected is appropriate for your child. Transition services.By the time your child is 16 (or younger, if the IEP team finds it appropriate for your child), the IEP must include measurable postsecondary goals related to your child’s training, education, employment, and (when appropriate) independent living skills. The IEP must also include the transition services needed to help your child reach those goals, including what your child should study. Measuring progress.The IEP must state how school personnel will measure your child’s progress toward the annual goals. It must also state when it will give you periodic reports on your child’s progress. Signature page. The signature page indicates those in attendance at the meeting and some IEP’s require that individual team members check a box indicating that they agree with the content of the IEP. 4. What are my rights as a parent of a child with a disability? Each state sets forth the Parent’s Bill of Rights and Procedural Safeguards. Your district is mandated to provide these to you each time you meet and upon your request. They are also available on most State Department of Education Websites. You can request that specific items in the Procedural Safeguards and Bill of Rights be explained in language that you can understand. 5. How often should we meet to discuss my child’s IEP? IEP teams are mandated to meet annually to review/revise IEPs. The present level should be updated to reflect the current impact that the disability has on the student’s learning, the student’s successes, changes from previous IEP cycle, and parental concerns. All goals should be updated to reflect the student’s areas of concern listed in the present level of academic and functional performance. Annual meetings are the minimum requirement but teams can meet more frequently as needed to meet the changing needs of the student. 6. How do I request an IEP meeting to discuss concerns? First, it is recommended that parents determine if a meeting is necessary. Questions about services and progress can be directly addressed with the service provider or case manager. Anything that does not change the current IEP does not necessarily warrant a meeting with the team. A concern that may change the current program should be discussed as a team and warrants a meeting. Parents can contact any member of the IEP team to request a meeting. However, the most direct and effective route is to contact your child’s case manager in writing and request an IEP meeting. 7. Who are the members of an IEP team? Other people who have knowledge or expertise about the student, invited by either the parent or the agency. 8. Who should attend IEP Team Meeting? All members of an IEP team (see members of IEP team). School staff team members can serve in more than one role. A school district team member may be excused from an IEP team meeting with written agreement from the parent and the district if the content or related services are not being changed or discussed. When the meeting involves a change or discussion of the IEP team member’s course or related services, you and the district must agree. 9. Can school attorneys attend IEP meetings? This question has been extensively researched by Jeff Martin, parent of a child with a disability and law student in the PELE Clinic. He wrote a legal memorandum addressing this question suggesting that, in general, parent and school attorneys should not attend IEP meetings. A Policy Letter from the U.S. Department of Education to Senator Hillary Clinton supported this position. Jeff’s Memorandum includes an Action Plan to use when dealing with school attorneys at IEP meetings. 10. Can Parents Demand a Member of the IEP Team be Excluded? Demanding something does not lend to collaborative efforts and can cause more problems than intended. Parents may request that participants not be present due to certain circumstances although, those requests should be expressed objectively without emotion and should relate to 1. A student’s best interest or 2. Reducing an adversarial atmosphere for IEP development. Ideally, if there is a problem with a team member, that issue should become a priority for resolution. Parents have no say over staffing and more than likely, a student (and parent) will need to find a way to work with nonpreferred staff. Unless there is a safety concern, parents and staff should request and provide the services that students need. They should also attempt to keep things unemotional, objective, and businesslike. 11. I get so emotional in meetings with school staff. Do you have any tips to help me communicate and remember better? Write polite letters asking for clarification on issues (keep it short, stick to the facts, and ask for clarification/explanation. Ask for assistance from advocates as needed. There are many templates available for most circumstances that can arise. 12. Can I request an IEP meeting at any time or am I stuck because I signed the IEP for the year? 13. What is an IEP Amendment? Do we need to meet for an IEP Amendment? IEP Amendments changes to the IEP may be made by amending the IEP rather than by redoing the whole IEP. An IEP amendment can be made by either the entire IEP team at an IEP meeting or by agreement between the parent and school district staff. If the change is made without a meeting, then both the parent and the district must agree to the changes made to the IEP. If changes to the IEP are made, it is the district’s responsibility to make sure all IEP team members are notified of the changes. Parents should be given a revised copy of the IEP that includes any amendments or copies of the amendment pages with detailed notes explaining what was changed. Many states have forms for districts to use. 14. What should be included in notice of meeting sent home to parents? identification of any agency representatives that have been invited. 15. I cannot attend at the times the school wants to hold a meeting, what are my options? The IEP meeting is to be scheduled at a time and place agreed to by you and the school district. If you cannot attend the IEP meeting, the district will attempt to reschedule the meeting or use other methods to make sure of your participation, including phone or teleconference calls. Remember, best practices (and some states require) 10 days’ notice. If the district is unable to get you to participate after trying to schedule two separate meetings, they can go ahead with the IEP team meeting without you. 16. During meetings school staff uses several acronyms. I feel stupid asking but what does FAPE, LRE and other acronyms mean? Congress recognized that children with disabilities have special needs and passed what is now called the Individuals with Disabilities Education Act (IDEA) in 1975. That law said children with disabilities must receive FAPE (Free and Appropriate Education) in the least restrictive environment (LRE), or in other words, with other children of all abilities. 17. What are annual goals? meet your child’s other educational and functional needs that result from the disability. 18. Why are annual goals important? Measurable annual goals provide a way for you and your child’s teachers to decide which skills are most important for your child to learn during the up-coming school year. Measurable annual goals also provide a way to determine whether the services and placement are appropriate to meet your child’s needs and to enable your child to make effective progress. 19. What information is necessary to develop goals? Development of meaningful educational goals relies on up-to-date information gathered from each IEP team member about your child. This information is included in the Present Levels of Educational and Functional Performance section of the student’s IEP. Present levels of educational performance are determined by the results of her/his evaluations, school work, and observations and input from all IEP team members. This information includes a description of the effect of your child’s disability on his/her performance in all areas of education including academics (reading, math, etc.) and other, nonacademic areas (socialization, behavior, daily life activities, mobility, participation in extracurricular activities, etc.). It also includes parental and teacher concerns, student strengths, progress and changes from the previous IEP cycle, and most current evaluation results. A child’s level of performance helps the IEP team understand your child’s strengths and needs. The knowledge and skills a student possess NOW are compared to what students are required to know and do according to developmental standards and the curriculum frameworks. Based on this comparison a student’s needs are defined. 20. Who develops the goals? While many educators and related service providers come to IEP meetings with prepared goals, it is required that meaningful discussion and collaborative development occur. It is reasonable to expect those with qualified expertise to guide goal development for specific skill sets. It is a good idea for individual team members to prepare draft goals related to their area of expertise for team consideration. However, goals should be discussed, developed, and finalized at the IEP meeting by the IEP Team not an individual. IEP teams should engage in prioritization of skills most important to address for that IEP cycle based on the student’s individualized needs. Members of the team include the child’s parents or guardians, at least one regular and one special education teacher, an individual qualified to interpret evaluation results, individuals knowledgeable about the general curriculum as well as school programs and resources available, the student—if they are age 14-22 or earlier if appropriate, and others who know or have expertise about the child. 21. Should my child’s goals stay the same each year? No, districts must provide FAPE to students with disabilities. This means that they are responsible to ensure each student is receiving a meaningful educational benefit from the services provided. The district is accountable for producing data that demonstrates goal progress. 22. My child has DRA or STAR math goals. Is this appropriate? While ultimately, we all want our students with disabilities to achieve grade level expectations, writing goals to achieve a certain curriculum or test level is not best practices. The IEP Goals are NOT lesson plans or restatements of the curriculum content. Annual goals are statements in the IEP that describe outcomes. Goals should address specific skills that a student can reasonably be expected to accomplish that IEP cycle so that the student is able to access, participate and make progress in the curriculum of their peers without disabilities. This is the foundation for “individualized” in IEP development. Goals cannot be general grades or standard test scores/grade equivalencies as those are expectations for all students. Remember, an IEP goal should be relevant to the general education curriculum, alternative curriculum, transition expectations, functional or independent living skills. Goals must address individualized, specific skill sets requiring specialized instruction to help them reach their highest level of educational success. 23. 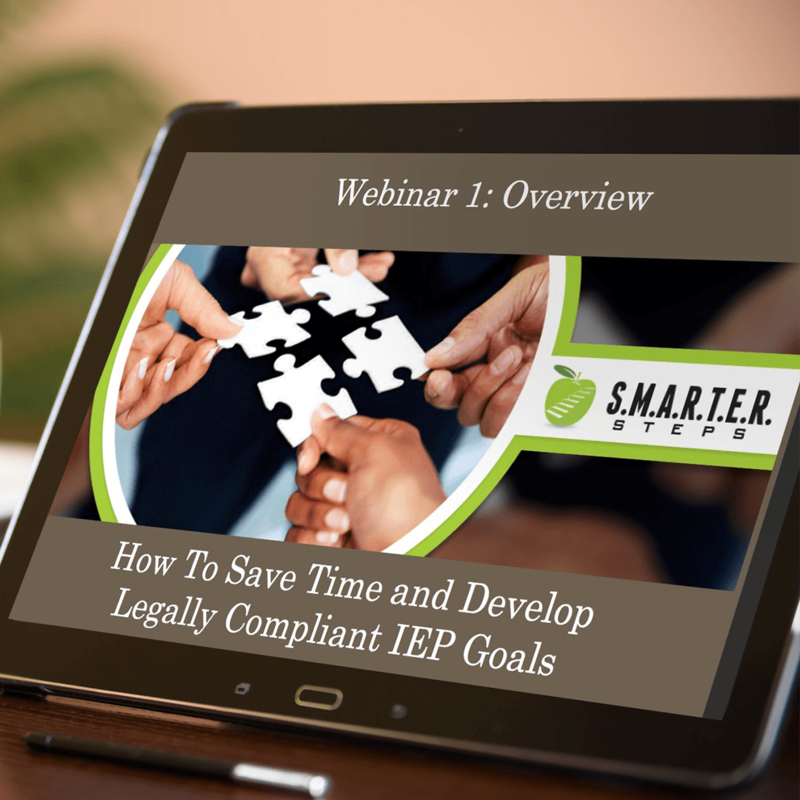 What is included in an IEP goal? IEP goals are mandated to be specific, measurable, attainable, and require peer-reviewed researched specialized instructional techniques to help students with disabilities. IEP goals should be individualized to meet that particular student’s disability limitations and learning needs. They must be relevant to the general education curriculum, alternative curriculum, transition expectations, functional or independent living skills. Progress toward goals should be communicated regularly to parents and the schedule and manner of that communication should be outlined in the IEP. Progress should be communicated at least as often as report cards but can be evaluated and communicated more frequently as the IEP team determines appropriate to meet the child’s needs. 24. Should my child have goals directly related to his/her disability such as anxiety or ADD goals? A child’s goals should address the major educational and functional needs of the student. If they are experiencing symptoms of attention or anxiety that impede learning or functional skill development, the team may determine those needs as priorities to address in the IEP. Remember, not all needs require goals. Some areas of need can be addressed through supplemental aids, accommodations, or modifications. 25. What are supplementary aids? Supplementary aids and services are intended to improve children’s access to learning and their participation across the spectrum of academic, extracurricular, and nonacademic activities and settings. Examples could include staff supports such as professional development, planning time for collaboration, co-teaching support, or student support such as providing a one on one aide, an AAC device, specialized equipment, accessible instructional material/equipment etc. 26. What is the difference between Accommodation & Modification and how do I know what my child may need? Accommodations change how a student learns the material. Modifications change what a student is taught or expected to learn. Accommodations and modifications can be related to classroom instruction, grades, lectures, assignments, pacing, tests, instructional setting, homework, executive function, behavioral supports, standardized testing, or other needs that may arise during the school day. 27. Is there a recommended way to track data for progress monitoring and reporting? Progress monitoring will be determined by the goal. Determine how you will measure the goal. There are many ways to measure achievement such as percentages, Likert scales, portfolios, rubrics, module mastery, maintenance tracking, checklists, etc. Determine how often you will track the goal. Frequency should be determined at regular intervals rather than random data tracking days. Third, you will need to determine mastery levels so you know when the goal was achieved. Consider accuracy, duration, rate, cumulative counts, etc. Last it is vital to include baselines so that you can determine progress. Analysis of improvement is essential to the progress monitoring process. Keeping data is important but you also have to be able to analyze it to determine progress. 28. How long is an IEP good for? Can I request a revision before the end date? IEP’s are meant to be reviewed annually but meetings can be requested any time during that IEP cycle. Annual reviews are the minimum requirement but teams can meet more frequently as needed to meet the changing needs of the student. If a concern arises or revisions are requested, teams should determine if a meeting is necessary. Questions about services and progress can be directly addressed with the service provider or case manager. Anything that does not change the current IEP does not necessarily warrant a meeting with the team. A concern that may change the current program should be discussed as a team and warrants a meeting. Parents can contact any member of the IEP team to request a meeting. However, the most direct and effective route is to contact your child’s case manager in writing and request an IEP meeting. 29. My child just needs to work on speech articulation, why is he/she considered a student with a disability and receiving special education services? Under IDEA, Speech Impairments (Sound System Disorders, Voice Disorders, and Fluency Disorders) are considered a disability category for which students may qualify for specialized instruction. Speech impairments are considered disabilities that may keep students from accessing the general curriculum and may have a negative educational impact on them. Speech articulation deficits may require specialized instruction and services from a licensed and certified speech language pathologist or assistant. 30. Will my child’s disability label follow them after high school? Legal rights may continue after high school graduation depending on the individual’s disability and circumstances. Children with learning disabilities who receive services under the Individuals with Disabilities Education Act (IDEA) or the Rehabilitation Act of 1973 (RA) in public elementary and secondary school may continue to have legal rights under federal laws in college programs and in employment. When students graduate from high school or reach age 21, their rights under the IDEA come to an end. The rights that may continue after age 21 are those under the Rehabilitation Act and the Americans with Disabilities Act of 1990 (ADA). Labels are merely for the purpose of identification when a disability exists and can outline services. If a child is found eligible for special education and related services and a parent or student of age disagree with that decision, or does not want to receive special education and related services, the parent or of age child have the right to decline these services. The school may provide a child with special education and related services only if parents or of age students agree. Also, special education and related services may be canceled by parents or students of age at any time. It is important to note, however, that if special education services are declined or canceled but later change your mind, the evaluation process must be repeated. 31. Does the IEP goal have to include current evidence-based practices? 32. How do I make sure the goal is measurable? Goals should address specific skill sets with defined outcomes. It should answer the who will do what, how will it be done, how often will it be monitored, how we know when it is achieved and what was the baseline before intervention. Goals should be written so that they are measurable and objective. Progress should be monitored at regular pre-determined intervals and reported to parents in terms that are understandable. Avoid vague and subjective terms such as “improve”, “increase”, “decrease”. Use specific action verbs to describe skill sets. 33. How do I know if school personnel are formally tracking data versus blind reporting of goals being met? You should have access to see the data tracking forms and graphs. Each data point should be documented with dates. 34. What if my child has unmet goals? Unmet goals can indicate that the IEP is not working properly for a student. The IEP team will need to reconvene and determine why the goals were not met and what revisions or additional supports or services may need to be added. 35. Should a child be expected to reach grade level achievement with an IEP? This depends on the nature and severity of the child’s disability, available supports and services and home support. Some students have life-long disabilities requiring supports and services and others are able to achieve expected levels within an IEP cycle. 36. Why is a passing grade good enough with an IEP? Schools have the burden of documenting and showing proof of educational impact. This is most often interpreted and judged based on academic grades. However, grades are not the only measure of educational impact. Educational impact should include academics, social, emotional and functional influences of the school day. A child may have passing grades but how much time, effort and relearning has been required to achieve those grades? A child could have passing grades but require extensive emotional support. A child could have passing grades but significant behavioral referrals due to disabilities. Grades should not be the sole consideration for determining educational impact. 37. What should an IEP goal look like? Is there a format or template to follow? Goals should include all 13 federal mandates. See link here. The most comprehensive template that covers all these mandates is the S.M.A.R.T.E.R. acronym. 38. Do you have a goal bank for specific disabilities or curriculum areas: autism goals, apraxia goals, science goals, math goals, etc. Goals are supposed to be individualized based on the student’s strengths and needs, educational setting, future life goals, and disabling conditions. Goal banks provide a cookie cutter approach that does not lend itself to individualizing an educational plan. Instead, we recommend isolating the general area of need then analyzing the specific skill sets within that area that would be most beneficial to address for that student. Skill sets can be found in the SMARTER Steps membership site or App. Those can be used to help develop specific goals for individual students. 39. My child has so many areas of need, how many goals should he have? Is There a Limit to the Number of Goals in the IEP? A goal or supplemental aid must be provided for each area of concern listed in the educational impact statement in the Present Level of Academic and Functional Performance. This can be in the form of services and goals or, supplemental aids, accommodations or modifications. A goal must be written for each specialized instructional or related service listed. All goals should be reasonably attained within the IEP cycle (1 year). 40. What is the difference between goals and benchmarks or objectives? They both demonstrate progress toward the goal. Goals address a target skill or behavior that needs to change. They state the circumstances under which the target behavior is to occur and the criteria for achievement. Objectives break the Measurable Annual Goal into discrete components that are short-term, measurable, intermediate steps. Benchmarks break the Measurable Annual Goal into major milestones that your student is expected to reach within a specified period of time. 38. Do you have a goal bank for specific disabilities or curriculum areas: autism goals, apraxia goals, science goals, math goals, etc. ?